I can only think of a handful of places in the world where I was as excited to eat the food as Mexico City. There’s something I just love about the flavors of Mexican food. Fresh-made tortillas are one of my absolute favorite things to eat. Add in crispy carnitas, some cilantro and a squeeze of lime and I’m seriously in my happy place. As we were heading out to Mexico City for the first time, I was super excited to try all of the popular Mexican foods like quesadillas and tacos that I already knew about, and to find other foods eaten in Mexico that were new to me. And believe me, we did just that! And a lot of it. So, do you want to know what foods you should be sure to eat, and what drinks you must try in Mexico? We’ve got some of the best Mexican food covered right here. Eating in Mexico is a real treat, something you definitely shouldn’t miss! Street Vendors like this one can be found in many of Mexico’s big cities. Most of these foods can be found at street vendors or in a street market. They are popular Mexico street foods! Very few, if any of them, are only made in specific restaurants only, so it won’t be difficult to find any of these popular Mexican foods, if you’ve got your eye out for them. Often, we found a street vendor selling two or three of them at one booth. Pambazo is the name of a Mexican white bread. It’s also the name of a sandwich made with that bread, which is dipped in a red guajillo chile sauce. The sandwich is typically stuffed with shredded beef or pork, fried potatoes, fried beans, a sprinkling of cheese and lettuce. The one in the photo is pork. A Molcajete is a stone bowl that is the traditional Mexican version of the mortar and pestle. It is often used as a serving bowl in Mexican cooking because it keeps it heat so well, for dishes that need to remain warm throughout service. The molchajete we tried was filled with a sort of spicy and sour tomatillo sauce with deep-fried Manchego cheese sticks and cactus plant bubbling away inside. The idea was that you put the cheese and sauce into a flour tortilla to eat it. A flauta is one popular Mexican food you’ve probably eaten or at least seen on a menu before at a Mexican restaurant in the United States. It’s a rolled-up flour tortilla and some type of filling, which could be beef, chicken or just cheese. The tortilla is then deep fried to make it super crispy. It’s usually served with shredded lettuce and some queso fresco. This was a new one for us. We’d never had a Tlacoyo before, so when we saw these oval-shaped fried pockets, we had to try one! The tortilla is thicker than a traditional corn tortilla. It is shaped like a taco, and stuffed with ground beans, cheese, beef, pork or other ingredients. The Tlacoyo can then be topped with whatever you like. We had the typical shredded lettuce, queso fresco, cotija cheese and green chile sauce. A gordita is very similar to a tlacoya, in that the masa cake is much thicker than a tortilla. Two pieces of griddled cake are used as bread to sandwich the ingredients. I’m sure there’s no end to what you can stuff in a gordita. The one we had was stuffed with cheese and then heated until the cheese was gooey and melted in the middle. Gordita means “little fat one” in Spanish. We had this version at a little stand in Mercado Roma, which I highly recommend, because it’s foodie heaven. Tuna tartare served with or on tostados is very popular. Aji tuna tartare is one of my favorite things to eat (along with Hawaiian poke). It’s just pieces of raw tuna mixed up with some avocado, corn, cilantro and green onion and then served on a tostado. We had a couple of different versions in Mexico City, because it was on every menu! If you’re not adverse to raw tuna, this one definitely should make the list of Mexican foods you try! If you’ve had mole, it was probably covering enchiladas. The common ingredient to all moles is chiles, and the other ingredients vary. Modern moles are made with chocolate, additional spices and other ingredients like nuts, seeds, garlic, onions, cinnamon and all types of chiles. The one we had at Pujol in Mexico City was incredible in that it had been cooked for 849 days, making it what chef Enrique Olvera’s calls the “mother sauce“. He serves it with his mole nuevo, which is a newly cooked sauce. The way he serves it, you just sop it up with tortillas. Mole is one of the most traditional Mexican foods, and it’s very good. Everyone’s had a quesadilla, right? I mean, we make quesadillas on the stovetop almost every morning for breakfast. It’s just a flour tortilla filled with cheese and warmed until the cheese melts. In Mexico City, we came across the deep-fried quesadilla, which is very similar, but is deep-fried in oil. We could have chosen from a number of stuffings, but we chose potatoes and cheese and it was delicious! 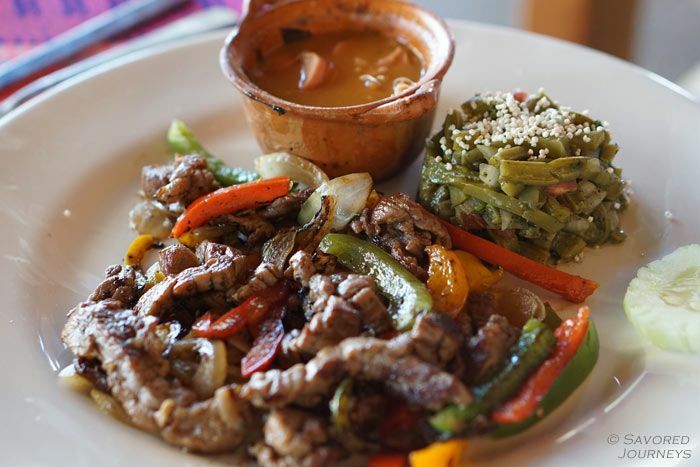 Fajitas are definitely one of our favorites of the foods eaten in Mexico. We often order this when we visit Mexican restaurants. Typically, you’ll find a beef, chicken or shrimp version, with peppers and onions. Of course, you’ll get a couple of tortillas on the side to put the filling in, too. The meat is flavorful and tender, and the peppers give it a nice acidic crunch. It’s some of the best Mexican food you’ll come across. You sit down at a restaurant. You’re hungry and you know that your main dishes aren’t going to arrive for at least 15 minutes. What do you do? Obviously, you order guacamole! The couple of times we ordered it as an appetizer, we were shocked at how much of it was on the plate. We could have easily split the guacamole and had enough to eat. It’s super filling. A side of tortilla chips comes with guacamole, usually, but we were excited to see some crispy, crunchy chicharons to eat with ours. Beef Barbacoa is a slow-braised beef shoulder cooked with chipotle chiles and cumin, sometimes in a pit in the ground. It’s tender, juicy, and well-seasoned, and lends itself well to shredded meat dishes, like sandwiches and tacos. That’s why you’ll find it on most menus you come across, in some form. We had it in tacos, but this ciabatta roll bbq beef sandwich was the best! We’ve had churros in a number of different countries – from Spain to Peru and now Mexico. It’s a fantastic dessert – deep-fried and crispy, sprinkled with sugar and cinnamon. I think I could eat these all day long. I know I shouldn’t. Sigh. The one we had at Pujol in Mexico City was perfect in every way. It was a thinner rope of dough than usual, but it was perfectly crispy and chewy at the same time. It was served with a dulce de leche dipping sauce. Where ever we go these days, we always try the beer. In Mexico, it’s easy to find a cervezaria (beer bar). They’re practically on every corner. We thought it might be difficult to find a good selection of microbrews in Mexico City, however. Nope! We were wrong. We visited many cervezarias with an extensive list of Mexican micro brews. The craft beer movement has definitely sprouted up in Mexico! Mezcal is a smoky liquor, similar to Tequila, that is often drank alongside some orange slices and chili salt. I saved the best two for last. Mezcal is one of the products of Mexico that we were the most looking forward to trying. It’s a distilled alcoholic beverage made from the maguey plant native to Mexico. “The word Mezcal comes from Nahuatl mexcalli metl and ixcalli which means “oven-cooked agave”.” Full disclosure – I took that sentence directly from Wikipedia. I still have a lot to learn about Mezcal, but it’s basically a smoky version of tequila. True Mezcal aficionados would scoff at me for saying that. In any case, it’s a smoky flavored liquor that is often served with orange slices and chile salt on the side. My new favorite cocktail, made with lime, agave, mezcal and basil. This is my favorite new cocktail. We’re even making it at home now! Here’s the recipe. We found and fell in love with this cocktail at the Hilton Reforma Hotel in downtown Mexico City. The ingredients are Mezcal, basil, lime, agave syrup and a rim salt. Together, these ingredients are outstanding as a cocktail. It’s sweet, smoky and sour at the same time. Trust me, it’s the best cocktail I’ve had in a long time. Want more? That’s just the short list of things you should eat in Mexico. Believe me, there are dozens more! But you’ll have to visit to find out. If you could recommend a few, what would be your favorite things you should eat in Mexico? Have a favorite Mexican food dish that is your go to? Tell us about it in the comments section! This entry was posted in Food and tagged Mexico. The Tlacoyo looks amazing! And I haven’t ever seen that anywhere on any menu in an American Mexican restaurant. I guess some things you really have to eat in the country they originate from! I am like you, though. I love anything with cilantro and fresh tortillas! Those Tlacoyas look amazing, and I have never heard of them, though I am a huge Mexican food fan. What a nice array of different foods you have described here. It’s making me hungry, actually! We’d never seen the Tlacoyas before either. They were my favorite new find! Ooooo I would love to try the Mexican microbrews, never had one before I don’t think! That churro also looks incredible – totally different from churros I’ve ever had. Love how thin it is, and that it was served with dulce de leche. It all looks incredible, take me back to Mexico please! Those tortillas and quesadillas make me hungry. I need to learn how to make them. The cocktail looks like mojito. I have never tried Mezcal but I’d love to try it one day :)… I love Mexican food but never tried gorditas something to try next time. I’ll have one of everything, please? Those pictures made my mouth water. Mexican food is so amazing and delicious, if done correctly. Fresh ingredients, beautiful colors, bursting flavors, what more can you want? I lived in Mexico for a year and absolutely love Mexican food, which is bad because I’m hungry now and reading this post! One thing I would add to the list would be tacos al pastor, which we would eat at least once a week in Mexico. Of course, they hardly have anything to do with the tacos that we eat in the U.S. Also, did you try the hamburgers and hot dogs there? They are really (and surprisingly!) delicious. We didn’t try hamburgers or hot dogs, but we went to a festival where they were being sold everywhere. Didn’t know that was a thing we should try. Stefan, I just posted the recipe for that great Mezcal cocktail. You have to give it a try. It’s so easy and it’s amazingly delicious. It’s been over 20 years since I went to Mexico and many of the foods you mention here I have never tried. Maybe it’s time for another visit. The deep-fried Quesadilla looks very tempting, I’d love to try it. Definitely have another trip! But if not, it’s pretty easy to make most of these dishes at home, including the deep-fried quesadilla. I love Mexican food in general- though I don’t like how I feel after (unhealthy) but we’ve all got to live a little 😉 By the way I tried Manchego for the first time in Spain last year and loved it- Manchego Cheese Molcajete looks really appetizing- I’d love to try that someday. It doesn’t all have to be so heavy and unhealthy. Much of it is actually fresh and healthy. We just tended toward the heavier stuff. I love tortillas! It definitely ranks at the top of my favorite culinary destinations. I thought I knew Mexican food before I saw this.. so many more dishes to try .. Manchego Cheese Molcajete with Tomatillo Sauce is calling my name! There is a vast array of foods in Mexico I’ve never had, which was surprising to me too! Is it safe to eat lettuce there? Or any vegetables that are eaten fresh and rinsed and not cooked? Hi Dien. As with any unfamiliar eating establishment, there is always the chance to unwashed vegetables. You do need to be cautious, but you don’t have to avoid them entirely. Look for a health certificate, or watch how the food is being handled and make a reasonable decision. You have mentioned so amazing facts about Mexican food and drinks and this can be so informative for them who are very much fond of Mexican food. I would like to try Mexican food and drinks because I love Mexican dishes so much rather when I went Canada I was tried some Mexican food in Senor Burrito Inc because there was so delicious Mexican food and drinks were found that I have eaten. I think this was the best restaurant for me in Canada because of its deliciousness of different Mexican food with drinks also. I love that you can find great Mexican food all over the world!